Well, I think it is when they talk about the London scenes with Saruman and Pj recalls how Christopher Lee kept on tripping on Saruman's robes, adding (and a few images are also shown) that the same thing happened to Lee Pace with Thranduil's costume. I haven't double-checked it though but I'm pretty sure. "Ask me what has been the biggest challenge in playing this role and I�d have to say it�s been walking up the stairs to my throne in the gold robe. I don�t think that there is a single take where I�m not treading on it and falling over. 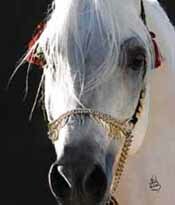 It is less than impressive when you are trying to look calm and regal and you keep tripping on your frock!" "Your kingdom is under attack, there's a dragon hanging out in Erebor, and you're wasting time on this nonsense!" Aaaarrgggghhhhhh..... I feel like they wasted such a great opportunity." It reminds me of the LOTR line "these hobbits will sit on the edge of ruin, and discuss the doings of their ancestors, and the pleasures of the table...." etc. Not an exact quote but it's amusing. But those are HOBBITS. *Sigh* Nothing else for it, unless there are EE scenes w. Legolas and Thranduil - after all, a fairly big deal was made about Gandalf meeting Thrain (RA said so much was cut) and that was just not there, at all. So there's some hope. Unless the movie at that time is pacing things, e.g. the whole scene Thranduil seems to be quite confident, the dwarves are bottled up, he's sure "kingdoms will rise and fall" but his people will be secure. I guess that is what we are supposed to get from that scene, that it's Tauriel who is agitating about the growing darkness in the form of the spiders - but it's hard for me to believe that Legolas, who is also roaming around Mirkwood, hadn't noticed there's an issue as well. And I think that's a HOLE, that Legolas as well isn't shown saying - "well, you know Dad, things in the forest aren't what they were, every day that passes things seem worse, more dangerous...."
Fantasizing here - that's a scene where Thranduil finds out the dragon is aroused, and Tauriel AND his son have gone missing? I fantasize about that - seeing the Elf King in utter fury and getting ready to ride out to deal with things - think it would be epic and hark back to the "ride of the wild hunt" folklore. And Elf King in wrath. Prepare his "moose" - or horse maybe - and his armor! There are a lot of variations out there (background).... I prefer the B&W one. To think it came from a magazine shoot! "This wardrobe is a *bleep* menace" - hysterical - but Mr. Pace, I'd say the same to RA when he commented about the heat of his costume - you guys look STUNNING. Just jaw-dropping. I am sorry you guys suffered under the lights, getting hurt, long hours but WOW. It's a wonder glass didn't shatter when you guys passed by - or the camera lens didn't crack. And the sets didn't melt under your booted feet. e) not care about any of the above! "I wouldn't mind Legolas aborting his chase after Bolg because he realizes Laketown needs protection and aid from the orcs (not to mention a dragon bearing down on them) and riding hard for Mirkwood to tell his father the men of the lake need help." Tho I don't know if Thranduil would be THAT eager to assist men, as someone who as seen ages pass - this is a really interesting question? Personally I don't think Thranduil would care, really, if Laketown got torched, BUT Tauriel is there. So assuming Legolas sees the dragon in the sky, would he not turn all the way around to help her? And Thranduil just knows the dragon is on the move, and then realizes Legolas and Tauriel are gone, and that's what gets Thranduil into things? Most of all, I didn't want Legolas to end up at Dol Guldur, which to me is stretching things re having Legolas in every battle. 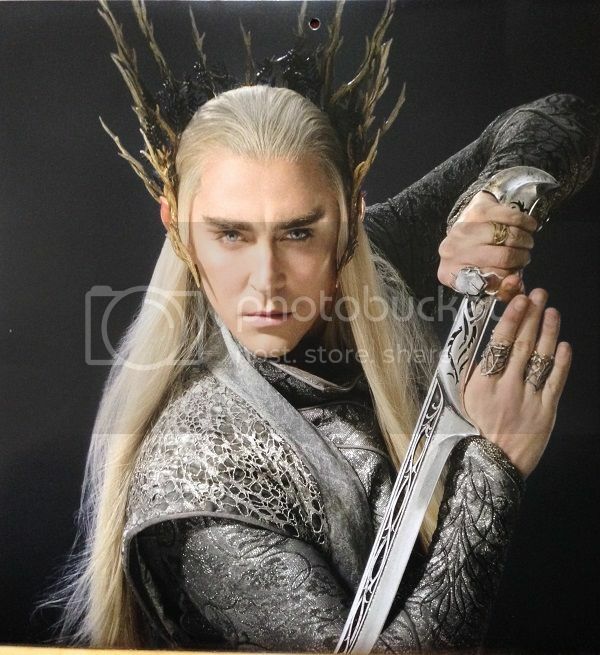 "He truly immersed himself in the character and he certainly mastered the elven movements. It was beautifully done. That's why I get so irritated when he's overlooked in reviews and interviews, etc." Round the Internet there is a wave of approval, for not that much (not enough) screen time. I also wonder that (like the dwarves and MF were all this past summer) there's a real reason LP is kept off the grid, pretty much, re interviews. I already believe that PJ & co. are well aware of the impact LP has had - the question is, will the editing of TABA give the people what they want, e.g. lots of Thranduil? For instance, (and Tolkien experts can weigh in here) just how long is Dol Guldur supposed to take, assuming the Lothlorien elves rescue Gandalf? That could happen pretty fast, considering Dol Guldur has been emptied. E.g., lots of screen time for Thranduil. Legolas will ride back to Lake-town after Smaug's demise, note that he's dead and the town has been demolished, and ride home to tell his father the news. That's when Thranduil will march on Erebor. As a Thorin fan at times I've idly wondered how the women on the crew could FUNCTION. 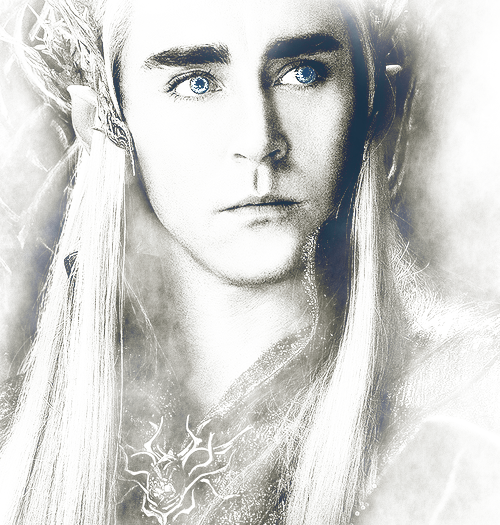 And now Thranduil too. How are these people so CALM about it all? The voice work alone freezes me in my tracks "other lands are not my concern" - purr, purr. Of course, I'd have to be professional and all that - but I've noticed nobody ever bothers someone who is cleaning, especially if you look tired w. messy hair and have some rags and spray bottles. So I'd be hanging around, sneaking around set pieces, "excuse me, I just have to get this spot off the floor......" That spot on the floor would have been REALLY CLEAN if I had been hanging around during the now-famous T & T scene. Of if you're in charge of Lee Pace's wardrobe where you constantly have to fluff or fix or what have you...having done costumes in my equity-waiver theater days I was always having to touch the actors. ETA: oh! I'm in Bree! To brush out his hair before and between takes. 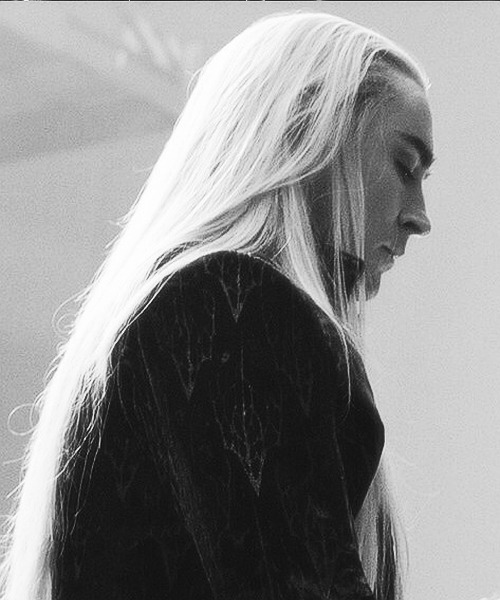 I have a Thranduil hair obsession! 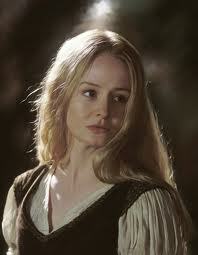 You need to get out of Bree. Lots of shifty characters and it's always raining. during on-set-breaks they put it in stocking-like hairnets. 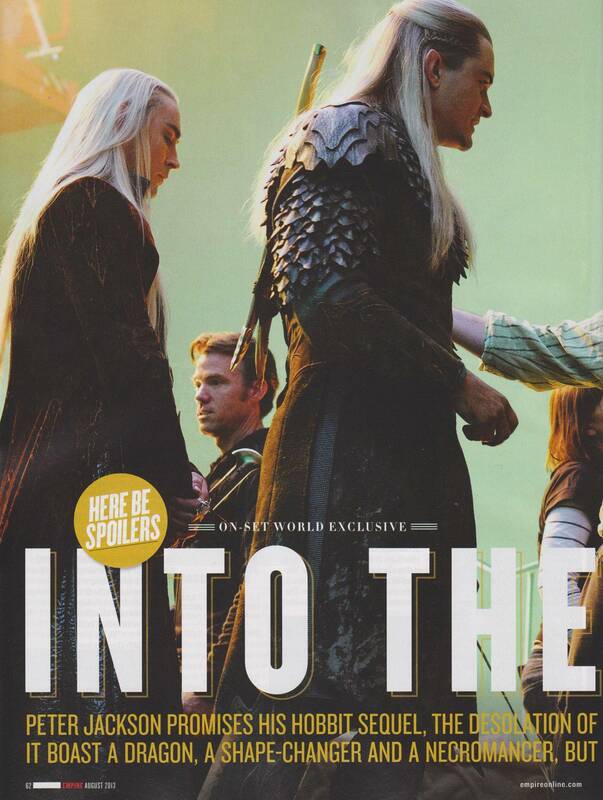 Probably Rowan Greene would volunteer to brush Thranduil's hair after taking the hairnet off. Have you noticed that all the costume and makeup assistants always seem to be standing on boxes when the have to fix Lee Pace? Lee Pace is perfect and requires no fixing. But he's a tall guy--I think he's 6'3". He makes his costars look tiny. No real fixing, but just a bit of finishing touches. For me re Thorin especially as I am enthralled, and Thranduil, if they stepped on me with those respectively amazing boots I'd squeal "oh thank you!" and just start clinging - either one would have to smack me with their sword "Get off, already!" - and then a couple of burly crewmen would haul me away with a glazed look on my face. Of course when the judge let me out as a harmless trespasser I'd be back the next day with a clipboard, because nobody ever bothers someone who looks like they are checking something. I humbly volunteer to hunt him down and drag him there myself. Giggling like an idiot the whole way of course.